Q: Special Exhibition "Sand to Snow: Global War 1915". Where does the exhibition concept come from? A: When we were discussing how to observe the Centennial of WWI we decided that each year from 2014-2019 would feature critical events of each year. When I arrived at the idea for 1915 of a truly global war by that time with the entries of Italy and Bulgaria and with the contributions of neutral nations like the USA and Spain and the world-wide setting for battles and other actions, it was a natural fit. Q: I was thinking about the title you chose. It seems that geography is a preeminent driver in this title. Do you confirm this also for the exhibition project and layout? 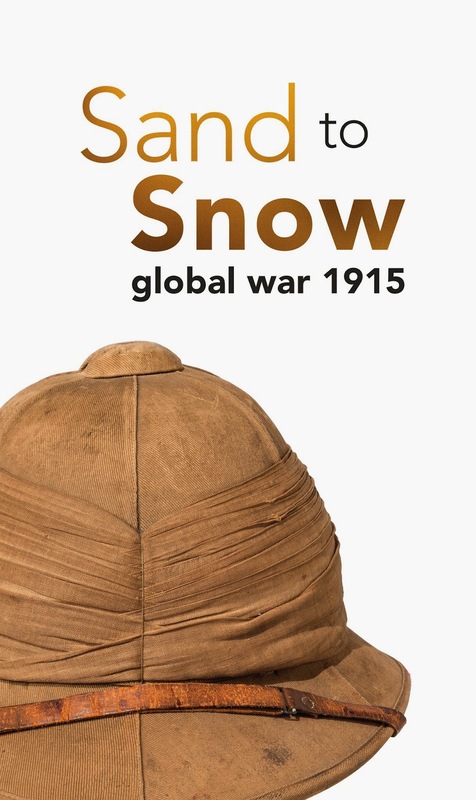 A: The title Sand to Snow reflects the physical geography and environments of the globe where the war was taking place, but also an example of where this occurred in a small area like Gallipoli where there was sand and also blizzards within the period of 1915. Also I wanted to feature nations not normally discussed. Q: Could you say something about the layout of "Sand to Snow: Global War 1915"? A: There are eight exhibit cases and each deals with a different front from the Western Front to the African Front. There is no chronological layout so the visitor can explore the years through each of the case studies. Q: Your attention is on the "special year" 1915 and both on belligerent and neutral countries. What's interesting while analyzing the case of neutral countries and what does the exhibition point out in their cases? A: Even though the United States was technically neutral in 1915, support for the Allies was ongoing. While many did not support any efforts to aid the Allies or even think about going to war, the Preparedness Movement in the U.S. started in 1915 with the Plattsburgh training camp. Theodore Roosevelt and Leonard Wood were the principle proponents of this movement. In the summer of 1915, under pressure from the National Security league and other patriotic groups, the War Department opened a training camp in Plattsburg, New York, where regular Army officers prepared the sons of well-to-do businessmen, at the trainees’ expense, to become future officers in the event of war. 1200 young men attended that first summer. There was a preparedness camp for women at the Women’s National Service School Camp near Washington, D.C.
Americans almost immediately volunteered for humanitarian and military service primarily with the Allies after the war broke out. They volunteered as ambulance and truck drivers, as hospital workers, as doctors and nurses. They crossed into Canada and received military training and were sent to Europe to fight under Allied flags. Americans joined the French Foreign Legion. The connections between Belgium and the United States in World War I began long before America became a combatant and continued after the Armistice. Almost immediately after the war started, relief and volunteer organizations were created to provide food and other means of support for the people of occupied Belgium. Switzerland’s neutrality, while stated in the Treaty of Paris of 1815, was more substantiated by its traditional position as the “Good Samaritan of the nations.” The Federal Council had issued a Declaration of Neutrality in August, 1914 that the country was “firmly resolved to depart in no respect from the principles of neutrality so dear to the Swiss people.” With Italy’s entrance into the war in 1915, all of Switzerland’s borders were surrounded by belligerents. Switzerland did care for refugees, assist in prisoner exchanges and in 1915 placed at the disposal of the belligerents the services of the Swiss Red Cross. Even though Switzerland maintained a defensive force, it did not represent a threat to her neighbors. Military service was compulsory for men aged 20 to 48 years old. In 1915, the Swiss Army numbered around 200,000 men. The Netherlands remained neutral throughout the war, but the war affected the country in many ways including their economy and making plans for the defense of her borders. Hundreds of thousands of Belgian refugees sought safety in the Netherlands. The RMS Lusitania was a British ocean liner built in 1906 and owned and operated by the Cunard Company. Lusitania sailed on her maiden voyage out of Liverpool, England on 7 September 1907 and arrived in New York, United States, on 13 September. On 7 May 1915, Lusitania was torpedoed off the coast of Ireland by the U-20, sinking in 18 minutes. Of the, 1960 people on board, 768 survived and 1,192 perished. Lusitania was carrying a number of Americans, women and children and citizens from other neutral countries including Mexico, Spain, Brazil and Sweden. It also carried war materiel including rifle and machine gun cartridges. The sinking of the Lusitania and resulting deaths of civilians and neutral nationals aboard the ship is considered one of the first modern examples of “total war” and a turning point in World War I.
Q: Could you also anticipate other initiatives coming from National World War I Museum at Liberty Memorial for the upcoming Centennial years? Thanks for your time. A: The Museum will have several additional special exhibitions during the course of the Centennial. In July, the Museum opens a special exhibition featuring a large collection of Australian War Art, currently on display at the Australian Embassy in Washington, D.C. In May 2016, the Museum will debut another special exhibition called “They Shall Not Pass: The Somme and Verdun.” That will be followed in 2017 with “Change the World: America Goes to War” and “Posters as Munitions.” In 2018, we will debut “The Human Record of War” and “Art and World War I.” In addition to the special exhibitions on display at the Museum, we have also curated online special exhibitions during the Centennial. To date, the Museum has launched three interactive online special exhibitions: War Fare: From the Homefront to the Frontlines, The Christmas Truce, Winter 1914 and Home Before the Leaves Fall.